Defy gravity with your every move. You don’t need a remote when you are the controller. Atmosphere uses altitude sensing technology to hover above surfaces and objects. Atmosphere works by knowing what’s beneath it and hovers above it. Just use your hands or any part of your body. Or, find other ways to play. You’ll be amazed as atmosphere defies gravity with your every move. 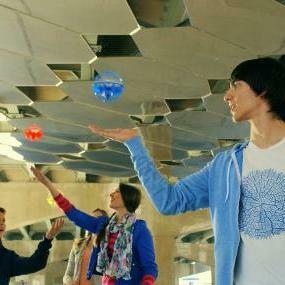 The Air Hogs Atmosphere is a powerful levitating sphere that defies gravity. 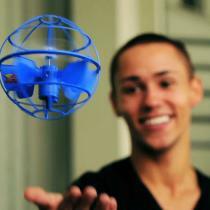 It uses altitude sensing technology to hover above surfaces and objects and can sense when it's near ceilings and walls. Use the palm of your hand, or any other part of your body to guide the Atmosphere. You'll be amazed as the Atmosphere defies gravity with your every move. The crash-resistant spherical cage allows the Atmosphere to smoothly bounce off walls and ceilings without interrupting its flight pattern. Its impact resistant construction gives users the ability to recover control of the Atmosphere without it falling to the ground. The Atmosphere includes a palm-sized charging cradle that is quick and easy to use. It acts as both a display stand and charging base while not in flight. Pilots can deactivate the flight of the Atmosphere by pressing the red stop button on the front of the cradle. The Charging Cradle requires 6 AA batteries to charge the Atmosphere for nonstop flight. Be amazed as the Atmosphere defies gravity with your every move. 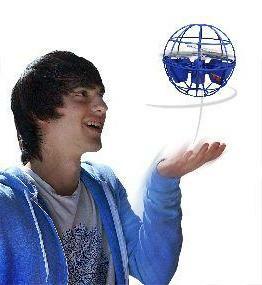 The Air Hogs Atmosphere magically hovers above objects and can be controlled with the palm of your hand! Built in LED's respond to changes elevation as you control how high or low the Atmosphere goes! The Atmosphere is designed to smoothly bounce of walls or ceilings without interrupting its flight pattern. The included charging cradle displays your Atmosphere as it recharges the internal Lipo battery.